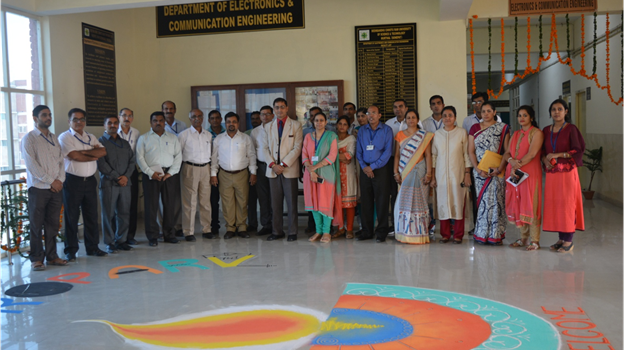 The Department of Electronics & Communication Engineering occupies a prominent place within the overall structure of the erstwhile CRSCE since 1987 & DCRUST since 2006. The Department offers Bachelor of Technology Programme with an intake of 60. Department also offers Master of Technology Programmes i.e. M.Tech. in Electronics & Communication Engineering and M.Tech in ECE (VLSI Design) with an intake of 18. The UG programme is NBA accredited whereas the NBA accreditation of PG programme is under process. The course curriculum has been designed incorporating inputs from academia & industries in such a way that optimum magnitude has been assigned to basic as well as advance course so as to keep the students abreast of basics as well as advances in the specific areas of technology. The department strives to keep various courses up-to-date so that these reflect current developments. The faculty constantly endeavors & engages itself in curriculum design. The department has well equipped and spacious laboratories with all modern facilities for experimentation at UG and PG levels. The laboratories have been modernized using liberal grants from World Bank under TEQIP and from the State Government and other funding agencies. Besides teaching, the department is also actively engaged in research activities. The department provides in-house industrial training during summer vacations to acquaint the students with the basic knowledge of tools to carry out advance research. To become a pioneer department of university by producing skilled, innovative, entrepreneur and ethical Technical Manpower in the core and related areas of Electronics and Communication Engineering, meeting the needs of the society, High-end Research and Industry. Endowing the curriculum subsuming the theoretical knowledge and practical hands on. Earnest focus on student-centric learning. Emphasis on achieving self sustainability by collaborating with industry, academia and research institute. Exposure to emerging real world applications. Thrust on overall development of students to build a healthy society by inculcating Human and Moral values. 1.Core Competence: To give more emphasis on understanding and analysis of all core courses of Electronics & Communication Engineering to develop strong understanding of advanced Electronics & Communication engineering courses with analytical capability at higher levels of academics and R&D activities. 2.Preparations: To prepare students to excel in higher level research and academic programmes or to succeed in industry / Technical profession through global, rigorous education. 3.Application and Synthesis: To give more emphasis on application and synthesis in all courses related to Design of electronic Circuits and their Simulation along with optimization. It helps in developing practical skills for experimentation and develops confidence for tackling the problem and initiating its solution. 4.Professionalism:To inculcate in students professional and ethical attitude, effective communication skills, team work, multidisciplinary approach, and an ability to relate engineering issues to broader social context. 5.Learning Environment:To provide students with academic environment composed of excellence, leadership, ethical codes and guidelines. Conduct investigations of complex problems using research-based knowledge and research methods including design of experiments, analysis and interpretation of data, & synthesis of information to provide valid conclusions. Environment and sustainability: Understand the impact of the professional engineering solutions in societal and environmental contexts, and demonstrate the knowledge of, and need for the sustainable development. Individual and team work: Function effectively as an individual, and as a member or leader in diverse teams and in multidisciplinary settings. Programme outcomes are narrower statements that describe what students are expected to know and be able to do by the time of graduation. These relate to the skills, knowledge, and behavior that students acquire in their B. Tech. through the program. h) To broaden education necessary to understand the impact of engineering solutions in a global, economic, environmental, and societal context. To indulge in Research and development activities that will be helpful to further technological development. problems and also to pursue higher studies & Research. confidence for tackling a problem and initiating its solution. To train students with good scientific and engineering knowledge, so as to comprehend, analyse, design, and create novel products and solutions for the real life problems/systems. communication skills team work skills, multidisciplinary approach, social engineering, and an ability to relate engineering issues to broader social context. Learning Environment:To provide students with and academic environment aware of excellence, leadership, written ethical codes and guidelines, and the lifelong learning needed for a successful career. h. the broad education necessary to understand the impact of engineering solutions in a global, economic, environmental, and societal context. To indulge in Research and development activities that will be helpful to further technological development. 6 Dr. Gitanjali Pandove Associate Professor Ph.D. Communication and Information Systems, D.S.P. Sh. Rajesh Kumar Lab Tech ‘A’ M. Tech. MrPardeep Kumar Lab Tech ‘B B.Tech, M.Tech.